The stadium hosted three matches for UEFA Euro 2000. The first match of the European championship for national football teams was won by Portugal after defeating England 3-2. In the second game, Sweden faced Turkey. The third game was won by Italy after defeating Sweden. 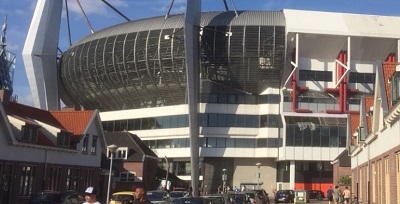 The Philips Stadion was expanded several times. The expansion of the four corners of the venue in 2002 led to its current capacity. PSV (Philips Sport Vereniging) are the tenants of the Philips Stadion. They were founded in 1913 as a team for Philips employees. World class players like Arjen Robben, Romário, Ronaldo, Ruud Gullit and Ruud van Nistelrooij played for PSV. In 1978, PSV won their first major European trophy when they won the UEFA Cup. PSV were crowned European football champions in 1988 for the first time in their history. The final of the tournament was played in Stuttgart in front of 64,000 fans. PSV won 6-5 on penalties after a goalless draw against Benfica from Portugal after extra time. PSV played their first-ever world championship final in 1988. The clubs which are currently known as FC Den Bosch, FC Eindhoven, NAC Breda, PSV and Willem II are the only football clubs from North Brabant with at least one top-division title. PSV won their first-ever domestic top-division title in 1929. In 2007, they became the second Dutch football club with 20 top-flight league titles. PSV drew an average home attendance of 33,000 in 17 home games in that domestic football league season. The Philips Sports Vereniging also won the Dutch cup tournament various times. In 2010, they made international headlines when they humiliated the former European champions Feyenoord 10-0 at the Philips Stadion. PSV also defeated some of the most famous and successful football clubs in the world at the Philips Stadion, like AC Milan, Bayern München, FC Barcelona, Manchester United and Real Madrid. They also won numerous matches in Eindhoven against their arch-rivals AFC Ajax from Amsterdam.